Patmos is twinned with three European Municipalities: The Municipality of Rome Grottaferatta, the Municipality of Brussels Auderghem and the Municipality of Somerset Glastonbury, England. 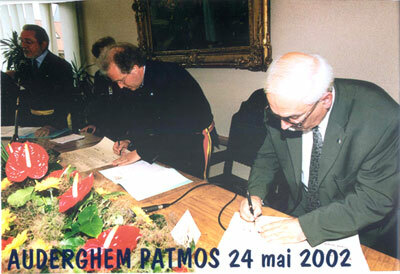 The twinning between the Municipality of Auderghem, Brussels and the Municipality of Patmos was typically signed on the 24th of May 2002. It was signed by the mayor, the minister of Environment and Trade Mr. DIDIER GOSUIN and the mayor of Patmos Mr. Mattheo Meliano. This took place at the Municipality building of AUDERGHEM, during a city council meeting where everyone was present. Many Belgian ministers and all the authorities of Brussels were present at the twinning’s ceremony. The Greek ambassador was present, together with the general consul of Greece, the Metropolitan, the commander of Federal police, representatives of the European community and a great number of other people. Many cultural exchanges take place between the municipalities. The Twinning with the Municipality of Rome GROTTAFERRATA, took place on the 20th March, 2004. Common data connect Patmos and GROTTAFERRATA. In GROTTAFERRATA, the Greek Orthodox culture is alive since 1004. The way God is worshiped is the same with that of Orthodox Churches. Something in common connects the city people and Patmos: it’s the historical monastery of Panagia Kriptoferis, which celebrates on the 26th September, a day in memorial of St. Nile. In 2004, the Monastery celebrated, with great splendour, 1000 years since its establishment. The relations between Kriptoferi Patmos began in 1937, when abbot Isidoros visited the island. But perhaps it goes back to the Byzantine period when close relations existed between the Monastery of John the Theologian and the monastery of Kalavria , where the monks of GROTTAFERRATA came from. These relations continue with the Twinning, which took place on 20th March 2004 at the library of the Panagia Kriptoferi Monastery, in the presence of the 7 mayors. The mayor of Patmos Mr. Kamposos, was represented by deputy mayor, Mr. Manolis Gryllis. On the 26th September 2006, in celebration of theTwinning, The Municipality of GROTTAFERRATA, renamed a public park “Giardini di Patmos” (Gardens of Patmos). This park is located in the heart of the city, and it was called “Gardens of the Holly Heart”. In this space a block of schools houses 500 students. The area is a children’s “MARKET”. There is a theatre, a playground for younger children, basket ball, volley ball and football courts, an in door sports arena and a cultural and entertainment centre. 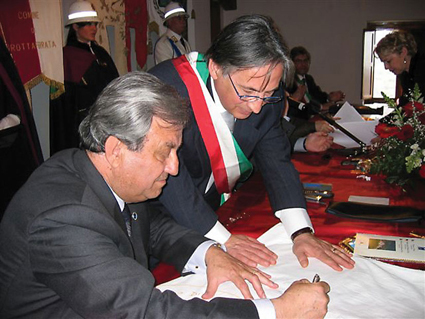 On the 6th September 2007 the twinning was sealed on behalf of Patmos, by giving the name of GROTTAFERRATA to one of the island’s roads. 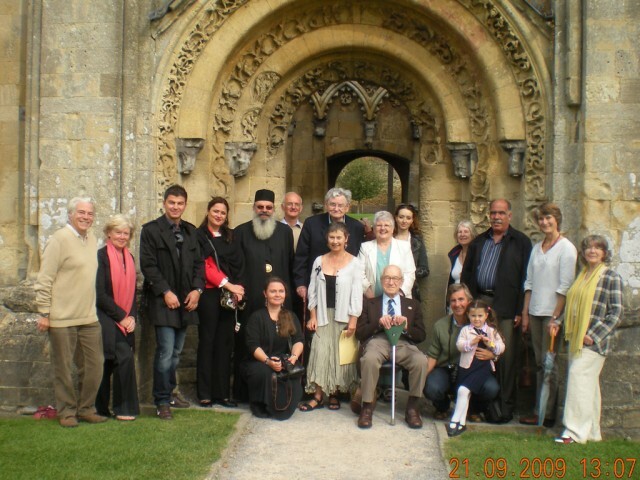 The twinning with Municipality of Glastonbury, took place on 21st September 2009 at the English town. The town's mayor Mr. Edward James had prepared an excellent ceremony, where John Dalton, with his Celtic Harp, gave a concert and guests we welcomed with an English traditional meal. Apart from the mayor of Glastonbury, the City Council, the citizens of Glastonbury, representatives of the Municipality of Patmos and many other citizens discussed cultural and athletic exchange. According to the history of the twinning, it has been characterised as Twinning in perpetuity. This Twinning’s proposal, which was accepted by the Patmian City Council in March 2008, was made after the visit to our island by small committee that consisted of , the Deputy Mayor Ms. Zo d’ Ay, the president of the Regional Council and the Deputy Mayor of Glastonbury, Edward James and his wife . They met with the Abbot of the Holly Monastery and the Mayor of Patmos. They came to the conclusion that Patmos and Glastonbury share many historical characteristics that derive from Christianity, e.g. Joseph of Arimathea lived on the ancient Island of Avalon, and John the Theologian, Christ’s most beloved Apostle, lived on Island of Patmos. They both carried a messages of Christianity. We should note that this is the first twinning between Great Britain and Greece.